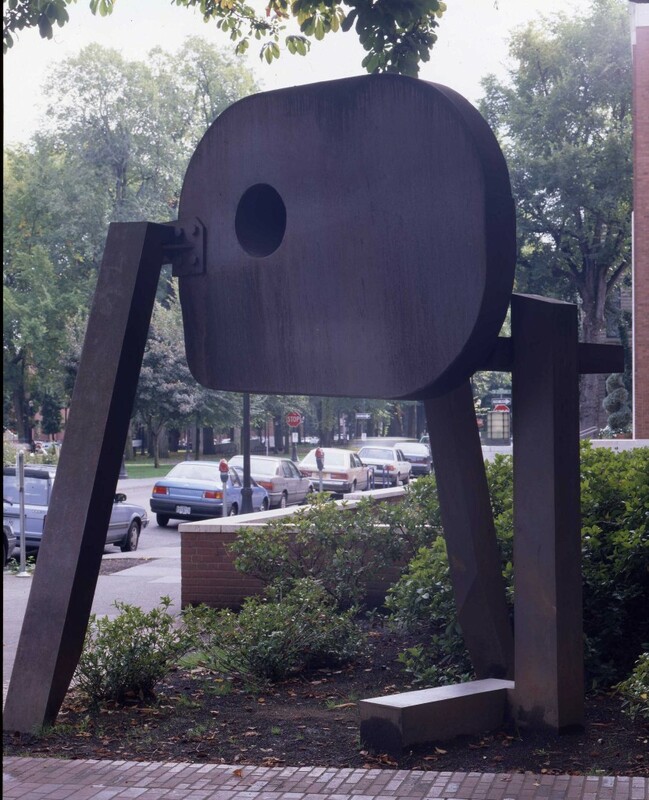 People tend to forget that Kelly started out as a painter, even though he’s often painted directly on his metal pieces (mostly early and later in his years as a sculptor; in the middle period he pretty much let the metal speak for itself). 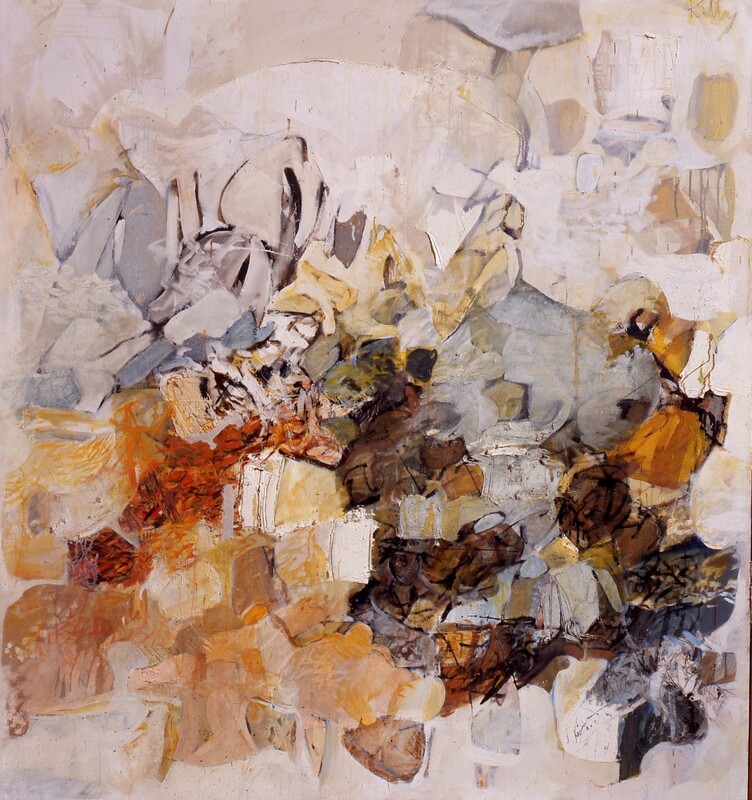 In fact, as the paintings included in the museum’s retrospective attest, he was a very good abstract painter. Like a lot of young artists, and especially those who eventually move on to three-dimensional work, he loved the way you could layer paint onto a surface like so much Spackle, creating waves and globs and little peaks and valleys. Unlike a lot of paint-masons’, his slathers exude both balance and movement: the paintings are gleefully quick. Kelly’s big pieces are often animalistic, sometimes suggestive of calligraphy or Asian script, always poetic. They combine massive brawn with exquisite joinery, a signature especially noticeable in several of his more recent works, in which large shaped pieces are fitted together like surprising three-dimensional jigsaw puzzles. Most of these sculptures are meant to live outdoors, where they can engage in a conversation with a cityscape or, more potently, a garden or a woods. If one thing distinguishes these works it’s that they suggest the presence of human intelligence not against, but within nature. Bold and humble at once, they imply not a reluctant accommodation but an active and eager communion. Romantic yet practical, they express a strain of rugged American natural utopianism that is particularly vigorous in the Pacific Northwest. Moving them indoors, even to the expansive main-floor galleries of the Portland Art Museum, alters their essence in intriguing ways, inviting viewers to see them as singular works of the imagination, divorced from their natural element. They gain something in connoisseurship as they lose something of their sense of place. Scale, for one thing, is thrown askew. 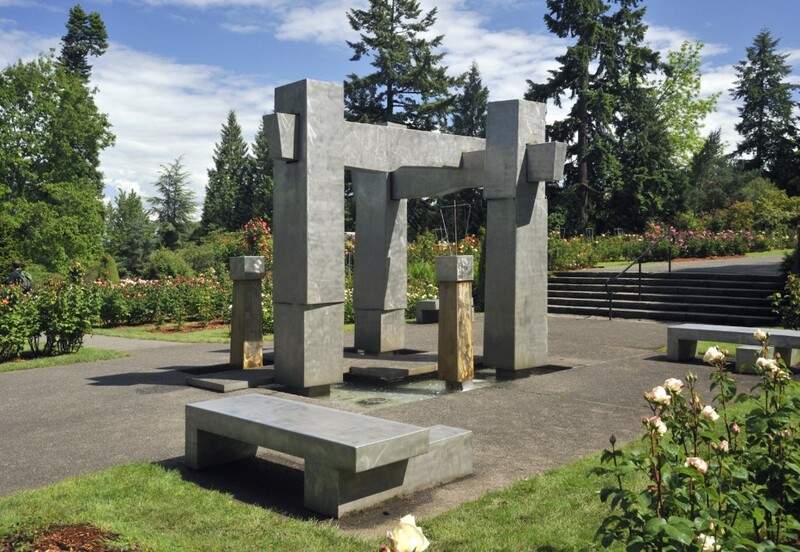 On Thursday morning, during a press tour of the exhibit, the difference surprised even Kelly as he considered a piece that had been moved into the gallery from Leland Iron Works, his five-acre home/studio/sculpture garden near Oregon City. There, he commented, the sculpture seemed dwarfed by its surrounding trees, a quiet and pleasing insertion into a larger landscape. In the museum, “it’s gigantic” — a monolith almost scraping the ceiling. For reasons of both size and availability — 1972’s eighty-foot-long Gate F, from San Francisco’s Candlestick Park, for instance — are represented by maquettes, which by indoor standards can be pretty massive (the one for Gate F stretches almost seven feet wide) but which do their own bit to fiddle around with scale. Born in 1932 in McCall, Idaho, Kelly graduated from Roosevelt High School in North Portland in 1949, and has always been a man of the Northwest. But he was also an avid world traveler and outdoorsman, accompanied by his second wife and fellow artist Bonnie Bronson, who died in a climbing accident on Mt. Adams in 1990 (his first wife, Jeanette Kelly, died at age 28 in 1960 after a brief illness), and later with his companion Susan Hammer. Nepal, India, Yucatan, Belize, Thailand, Cambodia, Guatemala, Chile, Argentina, Brazil — he became a regionalist in the most fully realized sense, aware of the rest of the world and incorporating it into his own view. At Thursday’s press opening, after listening to other people talk about him and his work for a long time, Kelly ambled to the microphone and made two short statements. The second was this: “Without my friend Susan Hammer, I wouldn’t be here.” The first was this: “This is not about me, it’s about the region.” By that I took him to mean that he is one of many artists, present and past, working in the Northwest, helping to define what it is environmentally and industrially and aesthetically. Hilda and Carl Morris, Frank Boyden, Frederic Littman, Louis Bunce and many, many others are wrapped inside that quiet embrace, imagining this life in this place. It’s a matter of scale. 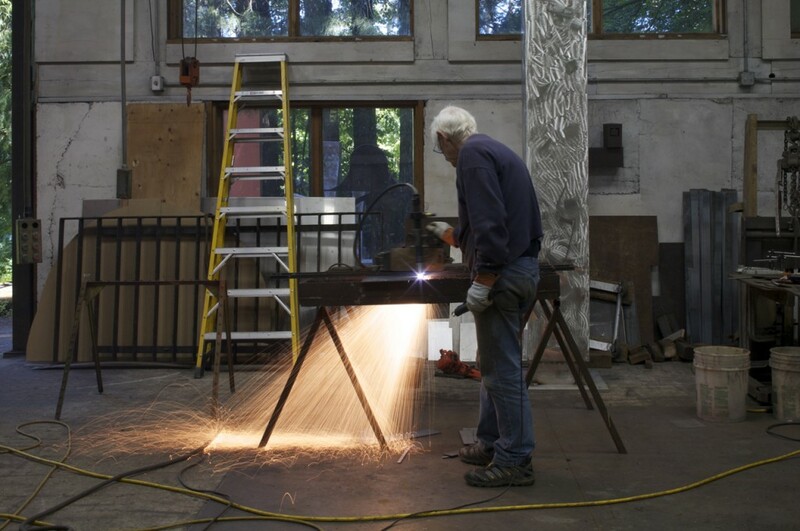 Lee Kelly in his studio at Leland Iron Works, outside Oregon City. Michael J. Burns.